Mark McGowan joined Stephen Price and Andrew Waddell at the Forrestfield location. 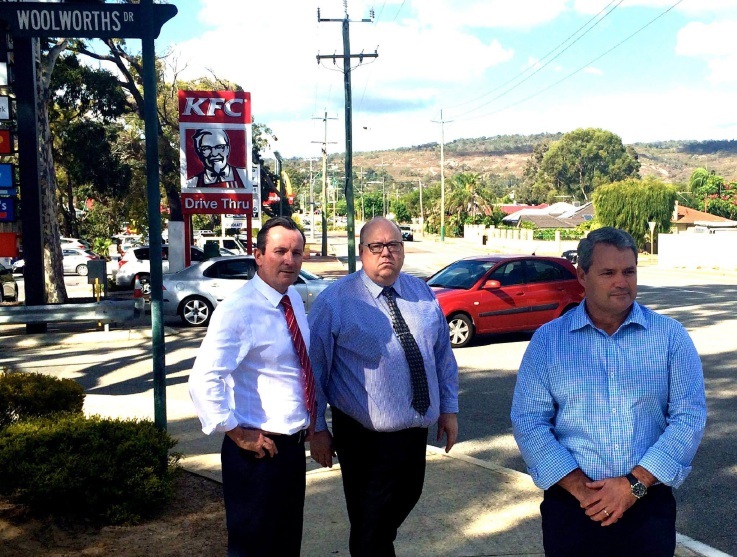 FORRESTFIELD Labor candidate Stephen Price and Opposition leader Mark McGowan have inspected a traffic hot spot in the area that is of growing concern to residents . “The intersection of Woolworths Drive and Hale Road is a well-known problem traffic spot which should have been fixed a long time ago,” Mr Price said. “The problems associated with this intersection have not just popped up, they have existed for many years and local members of cabinet, including Nathan Morton and Federal MP Ken Wyatt have done nothing to find a solution. Cr Waddell said Shire of Kalamunda would like to install traffic lights at the intersection but Main Roads would need to rethink the intersection at Hale Road and Strelitzia Avenue. Cr Waddell said Woolworths Drive and Hale Road, which becomes congested, has long been an area with complaints of a danger zone, which makes it a prime candidate for a roundabout but the road reserve is not large enough to make one. “Preliminary discussions with Main Roads are that the street lights are too close to the road for a roundabout,” Cr Waddell said. “The advice we have been given is that to make the roundabout at Strelitzia Avenue and Hale Road could be the logical way to go and the only downside would be that it costs more,” he said. Mr McGowan said his government would make the troubled black spot a priority if elected. “This intersection is an extremely busy entry point to Forrestfield’s shopping precinct and it’s time that a solution was found,” Mr Price said. “The Shire of Kalamunda have investigated the options and found the only viable plan is the installation of traffic lights. “Main Roads will need to improve traffic flow along Hale Road,” he said.